Elisha Guido Writes: What Kind of Person Are You? Tonight, before church, I made my way to Super 1 Foods for a quick dinner. Carrying only quarters in my pocket, I made my way to the produce section. I grabbed my fruit of choice and realized that I lacked a drink. Normally I am a water drinker, but tonight I was feeling like I needed something a little bit more satisfying. 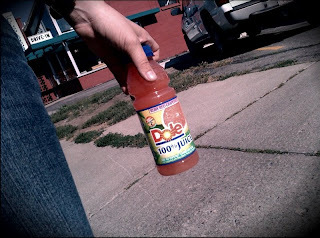 On the rare occasion that I buy a drink, I usually go for an all fruit drink. I really enjoy Naked juices. Unfortunately I only found Odwalla, and though I'm sure it's a great drink, it is no match in my mind to Naked. So I didn't go for either. Instead I kept on my search for a fulfilling elixir. I found myself standing in front of a whole refrigerated isle of cold drinks. They were all different. Some were short, some were tall, some were dark, some were light, some were healthy, some were absolutely not. I had a plethora of choices. I decided to go for the healthy ones. There they sat, all of those 100 percent juice drinks. The bright pink of the ruby red grapefruit juice immediately caught my eye. I reached up and grabbed the little plastic bottle. I filled with excitement and eagerly looked forward to the moment it's flavors would frolic in my mouth. Then, by some chance, I glanced down and saw the beauty of what sat at the bottom of the shelf. It was an iced tea. You know what kind I'm talking about. I'm talking about the real fancy kind that is bottled up in a hand crafted, fairly traded, foreign imported, glass bottle. It was literally screaming my name. Well, maybe not literally, but I felt like it was. It was in that moment that I was found facing one of the oddest decisions of my day. Okay, maybe this doesn't seem like an odd decision, but if you know me even in the slightest you would know that I make things odd... or even awkward. I literally stopped and asked myself, "What kind of person do you want to be? Do you want to be represented by a plastic, Dole bottle of grapefruit juice or do you want to be the person with the fancy, glass bottled, iced tea?" One side of me was mocking myself for even thinking about picking the bottle of fruit juice that little children drink while at the same time, another side of myself was being mocked for wanting to show off how great I could be by carrying around a cool glass bottle. I got to thinking. The things that we buy, the things that we own, and the things that we let others see us promoting really make an impact on the type of impression we make on people. Now, I'm not saying that anyone is going to judge you for drinking grapefruit juice over iced tea, but in that moment, I really did consider my motives for picking one or the other. In the end I went with the grapefruit juice. I wasn't so much conflicted with pride vs humility or wealth vs um... less fortunate, but rather I was deciding as to whether I wanted to be fancy and commonplace or unique and individual. I guess depending on my mood my choices are subject to change. Today I guess I am trying to be myself. Today I guess I am just wanting to represent me and a person who enjoys drinking grapefruit juice, even if it isn't as cool. Maybe on another day I may be trying to escape myself. Maybe on another day when I feel bummed about being myself I might buy the iced tea, but not today. I feel happier knowing that I am the grapefruit juice person. I like that person. That person is weird. That person is not normal. Maybe all grapefruit juice people find themselves conflicted between what they are representing when they buy their juice. After all is said and done I think what really matters is how satisfying the drink was, both on your taste buds and in your own self image. I'm proud of you for making the healthy choice Elisha! Yay for 100% juice! You make me want to go out and get some grapefruit juice because, your right, it does sound deliciously refreshing!